Culms: Erect, stout, stiff, triangular; bases usually pale brown. Leaves: Blades mostly basal, 6-10, flat, stiff, to 1/4 inch wide, grayish green, glabrous; margins rough. Sheaths: Tight, usually pale brown. 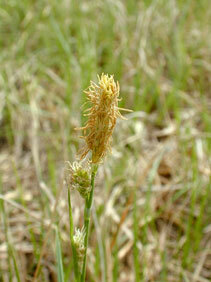 Inflorescences: Spikes, unisexual; terminal spike solitary, staminate, club-shaped, to 1.5 inch long, less than 1/6 inch thick, long-stalked; staminate scales blunt, purplish brown with transparent margins and green centers; lateral spikes 1-3, pistillate, oblong-cylindric, up to 1.25 inch long, about .25 inch thick, stalked or uppermost nearly sessile, occasionally with male flowers in upper portion; bracts subtending spikes leaf-like, shorter than inflorescence; pistillate scales broadly ovate, usually shorter than perigynia; margins purplish to reddish brown; midribs green; short-awned; perigynia 8-30 per spike, usually in 6 rows, mostly overlapping, 3-sided, many-nerved, yellowish green to brownish; beaks minute, slightly bent. Fruits: Achenes, triangular, dark brown, 1-seeded; stigmas 3. Habitat: Open, dry or damp upland prairies and wet meadows, most abundant on limestone or chalk soils. Distribution: Principally east 1/2 of Kansas. Comments: Named for Samuel Barnum Mead, (1798-1880), a U.S. botanist and physician.